Designed for comfort & style. Contoured seat & back with lumbar support. 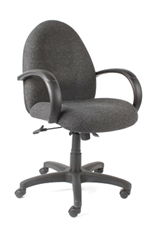 Comes with a 2-lever infinite lockable tilt or upright lockable tilt mechanism fitted on swivel chairs. Accompanying Guest chair is available. Chrome base available for an additional charge.